Just Another Day...: What's in My Amazon Shopping Cart?? One of my favorite food bloggers wrote a post today about what's in her Amazon shopping cart. I found it quite interesting to see what other foodies/moms/humans are pining for and decided to share a glimpse into my Amazon shopping cart (and/or Wish List) with you! 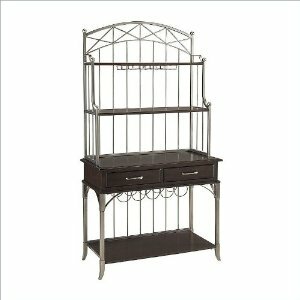 #1: Homes Styles Bordeaux Bakers Rack ($323.71) - This gorgeous bakers rack is the future home of my cookbook collection, a small lamp and maybe a little ivy plant of some sort, not to mention my tiny collection of "fancy glasses" and the wine bottles I use for cooking (not drinking). I'll stash some placemats and fabric napkins in those drawers, too. I have the perfect kitchen wall selected and have recently hung a family photo there so as to not stare at a blank wall that is screaming "Insert Bakers Rack Here!" every time I look at it. Patience, my dear self! 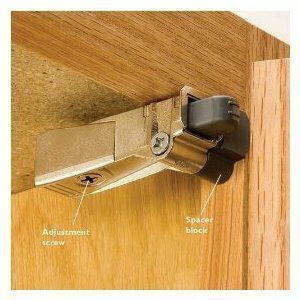 #2: Blumotion Hinge Adapter - 25 Pack ($77.49) - When we built the house, we didn't have the option to make any upgrades to the kitchen cabinets we selected. One of my must-haves (okay, so maybe "nice-to-haves") is these handy adapters that close your cabinet doors for you. ((Wow. I sound lazy.)) They just make it to where you can close the door and it won't ever slam -- it just closes with a soft, gentle close. Who wouldn't want such a thing?! And if we're being technical, we actually have 27 kitchen cabinets, but I'm thinking I can get by with this handy 25 pack. I rarely use the cabinets above the fridge anyway. 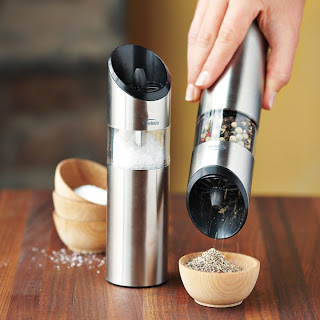 #3: Graviti Electric Salt & Pepper Mills ($39.95) - "Adding fresh-ground sea salt or pepper to food can be as effortless as a flip of the wrist. Invert these battery-operated mills over food, and their blades begin to whirl. Turn them upright, and the mechanisms shut off." Such a fancy description (courtesy of Williams-Sonoma), but you get the gist. Me likey. And the fact that each one requires six (6) AAA batteries? Sort of astounding, huh? 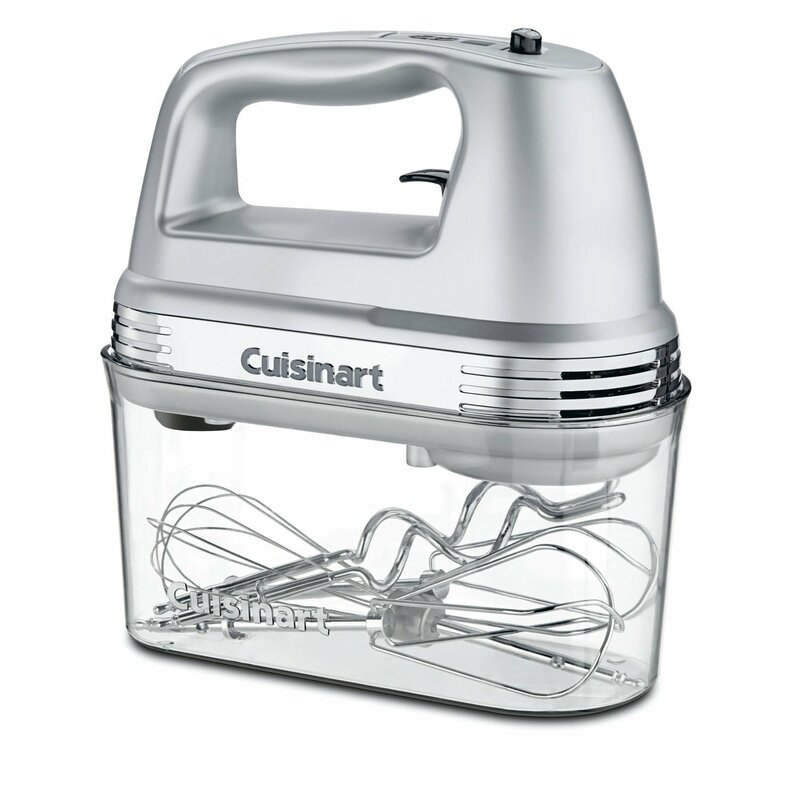 #4: Cuisinart Power Advantage Plus 9-Speed Hand Mixer with Storage Case ($71.33) - I don't always have the time nor the need to bust out my Kitchen-Aid for heavy-duty baking, so it'd be nice to have a high-power hand-held that I can rely on. I love how cute this one is (priorities, right?) and the ingenious storage case is a bonus, too! And of course we can all agree Cuisinart is a quality brand when it comes to kitchen appliances. 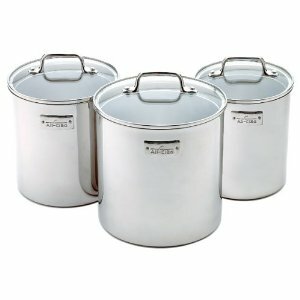 #5: All-Clad 3-Piece Canister Storage Set ($100.93) - Okay, I have to confess -- these kickin' canisters are no longer in my shopping cart. They're in a UPS box being Amazon Primed straight up to my door, arriving on Friday. I've been eyeing these for quite some time, and I finally decided to give in and pay a premium for pretty storage for my flour, sugar and brown sugar. I'd like to consider a second set for powdered sugar, chocolate chips and cocoa, but I don't think I could get hubs on board with that idea. I can't wait to see these beauties sitting on my kitchen counter! Now I'm thinking I ought to search for a set of All-Clad pots & pans to match! #6: Perfect Light Desserts: Fabulous Cakes, Cookies, Pies, and More Made with Real Butter, Sugar, Flour, and Eggs, All Under 300 Calories Per Generous Serving ($19.77) - I think the crazy-long title says it all, right? If my passion involves a lot of baking (and sampling, of course! ), it just makes sense to find "healthier" dessert recipes to try out. 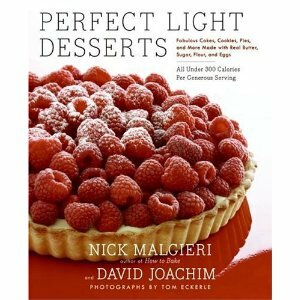 I'm a big fan of Nick Malgieri's work (his Oatmeal Raisin Cookies from this book are TASTY!) so I'm sure this cookbook would be a valuable addition to my collection. #7: They're Real! 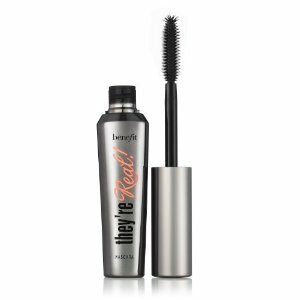 Mascara ($22.00) - I'm always on the hunt for an amazing mascara, and this is one I have yet to try. The reviews are pretty mixed -- some say it's the best while others claim it's no better than some random drugstore brands. I'd like to see for myself! For those of you who made it this far, let me just say that I am desperate to share some pics of our kitchen backsplash!! However, we just (finally) grouted it a few days ago, which means we just now (yesterday) caulked it and we still need to seal the grout and replace the outlet covers. Until those tiny little remaining tasks are complete, I'm not ready to share the big reveal. Just know that it is in fact GORGEOUS. And I do love it dearly. And I'm beyond stoked to share it with you!